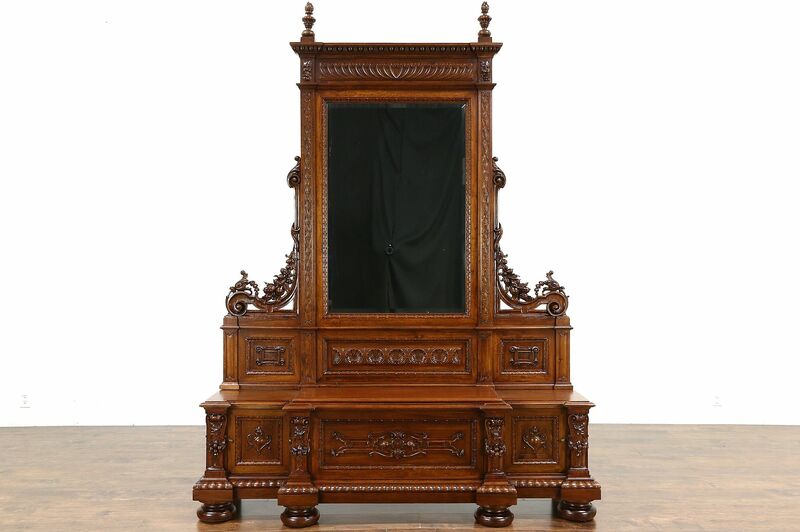 A magnificent entry hall bench and mirror was hand carved in Italy about 1890 for a palazzo near Milan. Solid walnut with deeply sculpted details, the restored finish is in excellent condition. Solid wormy walnut has exceptionally warm patina, there are minor shrinkage separations from age and restorations over the years. The original beveled mirror has a chip and a little antique smoke to show its age. There is storage under the bench seat of this grand and historic furniture, which disassembles for easier delivery. Dimensions are 6' wide, 19" deep and 8' 3" tall to the top of the finials. The seat is 22 1/2" tall.